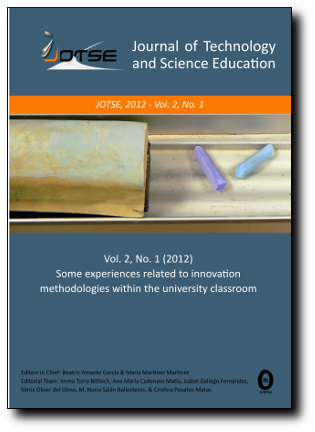 The Editors-in-Chief of the Journal of Technology and Science Education (JOTSE) in collaboration with the Scientific Committee of the UNIVEST’15 are going to publish a special issue on JOTSE: V International Conference UNIVEST’15 “The Challenges of improving assessment”. They need to register with the journal prior to submitting or, if already registered, can simply log in and follow the online manuscript submission process. For technical support or queries related to manuscript submissions, they need to contact info@jotse.org. Authors should take into account, during the preparation of their manuscript for publication, that the total length of the article should not exceed 10 pages. All papers must be clearly written in English, using correct spelling, grammatical, and punctuation. The communication style of the paper must be of academic standard. However, if the English standard used in the paper is not adequate, authors will be given the opportunity to revise their papers and they will be referred to editorial services, at their own cost. The manuscript file must be in MS Word format only (not PDF) using Template.